By 1890 about a thousand American bison remained of the tens of millions that had lived on the plains a century earlier. And so in 1886 William T. Hornaday, chief taxidermist at the Smithsonian Institution’s United States National Museum, went off to kill a few of them. “To all of us the idea of killing a score or more of the last survivors of the bison millions was exceedingly unpleasant,” he wrote decades later, “but we believed that our refraining from collecting the specimens we imperatively needed would not prolong the existence of the bison species by a single day.” Hornaday felt his role was to preserve for future generations the memory of vanishing species—in the form of carcasses for the museum. Hornaday bagged his bison—and then changed his mind. He was appalled by the decimation he witnessed. When he returned to Washington, he wrote in his report, “The nearer the species approaches to complete extermination, the more eagerly are the wretched fugitives pursued to the death whenever found. Western hunters are striving for the honor (?) 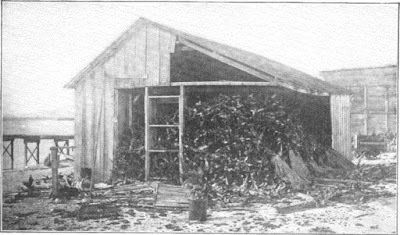 of killing the last buffalo, which, it is to be noted, has already been slain about a score of times by that number of hunters.” In 1905 Hornaday founded, with the support of Theodore Roosevelt, the American Bison Society, which proved instrumental in saving enough of the remaining animals to reintroduce them into wildlife reserves. In the intervening years, Hornaday left the Smithsonian and became the founding director of the New York Zoological Park (what we now know as The Bronx Zoo), but his tenure was not without controversy, as Bill McKibben discusses in the headnote preceding “The Bird Tragedy of Laysan Island,” a selection from Hornaday’s 1913 book Our Vanishing Wild Life. The island is literally covered with birds; there is, a low estimate, 800,000. [Later calculations were as high as two million.] Seal, turtle, and fish were numerous on the beach and might be easily taken. These animals were evidently unaccustomed to the sight of man, as the seal and turtle would scarcely move at our approach, and the birds were so tame and plentiful that is was difficult to travel without stepping upon them. The island remained virtually untouched until the 1890s. But then, from 1896 until 1909, it was managed by Maximilian Schlemmer, an immigrant to the Hawaiian Islands from Germany, who became jokingly known as “King of Laysan.” Schlemmer introduced guano mining and then egg harvesting. Yet it is not entirely accurate to imply, as Hornaday does in his essay, that Schlemmer came up with the idea of hunting the birds for their feathers. Instead, as Schlemmer’s grandson Tom Unger explains in a biography, the financially strapped “king” sold the rights to “phosphate, guano, and products of whatever nature” for $150 a month to a Japanese entrepreneur. 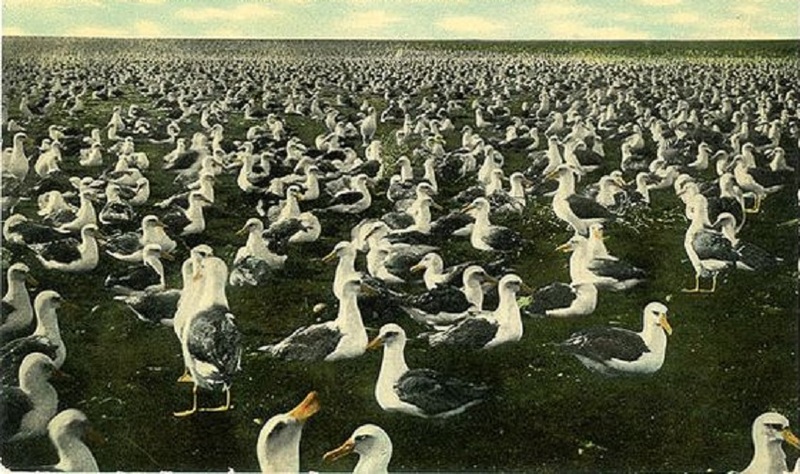 The Japanese workers quickly realized that most of the guano had already been mined and, with Schlemmer no longer living on the island, began harvesting the feathers, which would bring $6 a pound on the market. Schlemmer’s lease from the territorial government, however, clearly prohibited the killing or capture of the birds and he was—and is—considered primarily responsible for the calamity that ensued. The environmental tragedy did not end with the events described by Hornaday. As mentioned toward the end of the essay, Schlemmer had introduced rabbits to the island, presumably as food for him and his family while they were living there. As Unger notes, they escaped or were freed, “multiplied rapidly, and were soon munching their way into what was to become one of Hawaii’s greatest ecological disasters.” It took nearly fifteen years to exterminate all the rabbits—but not before they had destroyed the habitats of three endemic bird species, which became extinct. Two other species unique to the island—a finch and a duck—remain on the endangered list to this day. In the far-away North Pacific Ocean, about seven hundred miles from Honolulu west-b’-north, lies the small island of Laysan. . . . If you don't see the full selection below, click here (PDF) or click here (Google Docs) to read it—free!